was not moving her lips. her feet, of which only the toes appeared. When Bernadette's parents learned of her experience, they forbade her to return to the grotto, but her mother soon relented and allowed another visit on February 14. This time, Bernadette took some holy water, which she sprinkled toward the apparition in an effort to find out if it was from God. Again, her parents were unwilling for her to return, but allowed a third visit on February 18, in order to settle the rumour circulating that the apparition was the soul of a saintly dead parishioner. During this apparition, the Lady spoke for the first time, telling Bernadette, "I do not promise to make you happy in this world but in the other", after which the Lady asked, "Would you be kind enough to come here for a fortnight?" (A fortnight equals 14 days.) 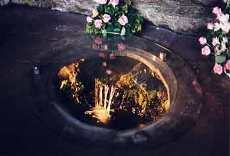 Before each encounter with the Lady, Bernadette would be irresistably drawn to the grotto, as if by supernatural invitation. The fortnight's remaining apparitions occurred during the rest of February and first part of March, ending March 4.
ever since. 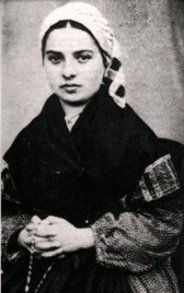 The first physical miracle occurred hours before the March 1 apparition: after a friend of the Soubirous family, Catherine Latapie, plunged her dislocated arm into the spring water it regained normal movement. For many decades now, this miraculous spring water has been bottled and distributed to people worldwide, while much of it is diverted for bathing purposes. 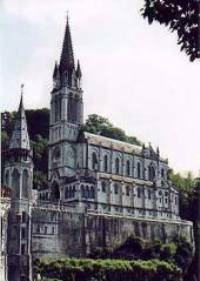 Although Lourdes' present-day population is only 17,000, it receives a staggering 6 million pilgrim visitors every year. 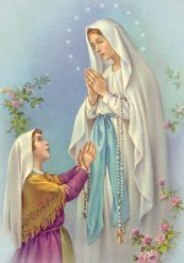 In 2008, Lourdes will observe the 150th anniversary of Mary's apparitions there: you can visit their Jubilee site here, or visit the portal of official Lourdes websites here. 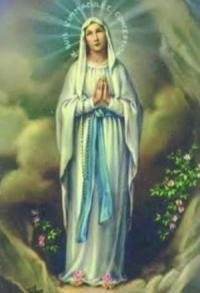 finished the Rosary the people questioned her, but there had been no further message or revelation. 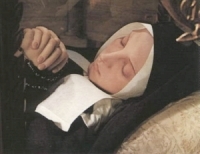 of the bone, and died at the age of 35.
viewing) in the Convent of the Sisters at Nevers, France.